Walking in downtown L.A. last Saturday, I veered off Broadway to Hill, and into Pershing Square where I met this gentleman, a gentle man. I offered him the coffee I’d bought but decided I didn’t want because it’s impossible to walk and take pictures while holding a cup, and the pictures were more important to me. I asked if he’d be offended if I offered him my coffee. He smiled and said, “no, I’ll take your coffee”. He hopped off the cold stone bench, spry and full of youthful energy. He stretched up to his full height, which wasn’t much more than my 5’2″ and through the few teeth he had left, he shared a story, much of which I couldn’t understand, but didn’t need to because his face and his gestures told it all. I wrote this poem and dedicate it to him, my Pershing Square Hero. his big guns, he was proud. and he smiled. a toothless smile. Born and bred for war. He was a boxer again. Knuckles coating with concrete dust. I cringed in pain for him. Rat a tat tat. tat tat. 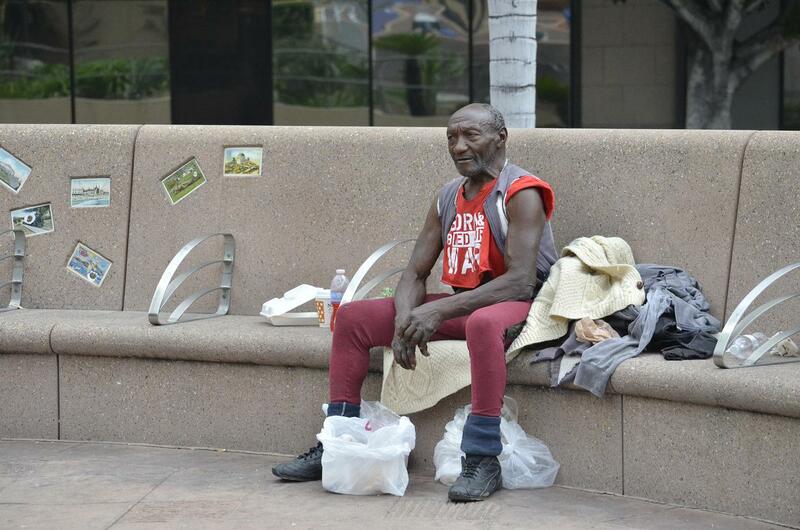 How nice of you to take the time and capture the true essence of this homeless man, by photography and poetry. I write poetry too and your poem reminds me of one I wrote called, Sometimes. Love your post… Really Nice! Thank you for sharing. What a wonderful face he has! And I love your poem. Thank you so much for capturing his demonstration! I have yet to actually do street photography, so I want to know … did you ask him if you could photograph him in action, or did you just go for it??? Okay, I’m going to find some courage (you’d think I was facing police with pepper spray) and take photos of HUMANS! Yikes! Yes I do follow him, and yes I remember that post about the wide angle lens. He has great info on his blog! I’m still learning the camera I bought end of 2012, so I won’t venture to the new lens arena for awhile yet, but it’s something to think about. I know what you mean about courage taking people pics, though. It’s an entirely different thing, but you take such great pics, you’ll get some awesome ones! !